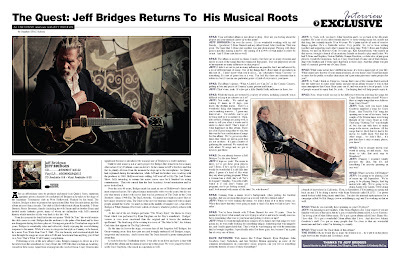 Discussions Magazine Music Blog: An EXCLUSIVE interview with JEFF BRIDGES! An EXCLUSIVE interview with JEFF BRIDGES! After an affectionate intro by producer and music icon Quincy Jones, rapturous applause greets a humble yet confident Jeff Bridges as he takes to the stage of the legendary Troubadour club in West Hollywood. Flanked by his band, The Abiders, Bridges is here to promote his eponymous Blue Note Records debut, his first album in more than a decade. The club is filled with friends (Ryan Reynolds, T-Bone Burnett, Pierce Brosnan), family (including his wife Susan and his brother Beau) and invited music industry guests, many of whom are unfamiliar with Jeff’s musical history which stretches all the way back to the late ‘60s. From the moment the band kicks into set opener “Hold On You,” the world outside the club ceases to exist: Bridges has the audience in the palm of his hand and he does not disappoint during this hour-plus set. Having not graced the Troubadour stage in 40 years, Bridges is remarkably calm and collected, clearly enjoying the overwhelming response to his music. While it’s easy to categorize his style as Country, to be honest, he’s more Tom Waits than Tom T. Hall. The raw honesty and emotional depth that runs through the songs are more akin to Folk and Americana than anything you’d find on a Now That’s What I Call Country compilation. 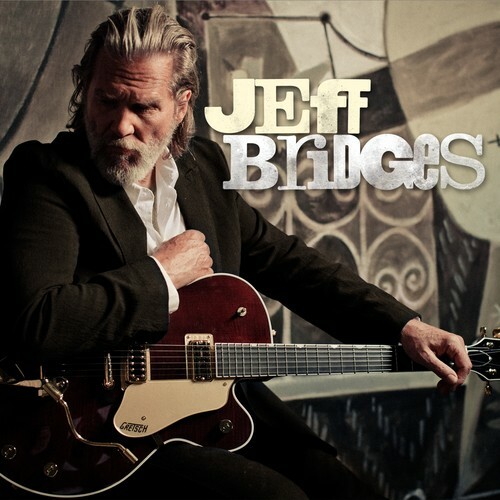 Performing seven of the new album’s cuts, Bridges manages to throw in a few favorites from the soundtrack to Crazy Heart, the 2009 film that won him an Academy Award for Best Actor. Apart from winning him the coveted Oscar, Crazy Heart is also significant because it introduced the musical side of Bridges to a wider audience. Truth be told, music is not a vanity project for Bridges like it has been for so many other actors (Cory Feldman, come on down!). In fact, music is Jeff’s first love and that fact is plainly obvious from the moment he steps up to the microphone. As Quincy had explained during his introduction, while Jeff and his brother were working with the producer in 1969, Hollywood came calling. Jeff went off to film The Last Picture Show, fully intending to resume his music career once he’d finished his acting commitments. That role earned him his first Academy Award nomination and he never looked back. Over the next 40 years, Bridges made his mark as one of Hollywood’s finest and most respected actors. He’s played many memorable roles over the years, but the one role that struck a chord with movie fans was his portrayal of The Dude in the Coen Brothers’ classic 1998 film The Big Lebowski. No matter how high his career flies or how many awards he wins, The Dude is the one role that has connected with so many people around the world. So much so that in the middle of tonight’s set, a fan offers Bridges a White Russian (The Dude’s drink of choice), which he politely refuses with a grin. At the end of the set, Bridges performs “The Weary Kind,” the theme to Crazy Heart which was performed by Ryan Bingham on the film’s soundtrack. Bridges’ version is even more emotional than the original and it leaves the audience spellbound. The final song of the evening is a cover of ‘The Man In Me”, the Johnny Cash tune that appears in The Big Lebowski. By the time he leaves the stage, everyone has all but forgotten Jeff Bridges, the Oscar-winning actor: they have just met and lovingly embraced Jeff Bridges, singer, songwriter and musician. And it seems that The Dude himself is pretty damn pleased about that. A week before the Troubadour show, I was able to sit down and have a chat with Jeff about the album and his musical career up to this point. We were joined by fellow scribe Dave Rayburn, who snuck in a question as well. SPAZ: Your self-titled album is just about to drop. How are you feeling about the project and your musical career up to this point? JEFF BRIDGES: I’m over the moon. It’s so wonderful working with my old friends… (producer) T-Bone Burnett and my oldest friend, John Goodwin. That was great. The band that T-Bone put together was just phenomenal. Playing with these guys is just like making a movie: the casting of it is 99% of what makes it either fly or not. And T-Bone cast this so well. SPAZ: The album is steeped in classic Country, but there are so many elements and layers to each of the songs that they transcend that genre. Did you purposely set out to incorporate so many influences on this project? JEFF: I didn’t set out to put as many influences as possible, but I am influenced by a lot of different kind of music. One of the things that T-Bone kind of specializes in this sort of… I don’t know what you’d call it… an ‘Alternative Music Universe” or something. It’s sort of genre-less in a way. You feel like there are elements that it relates to, but it’s not in one particular genre: it kind of reinvents it, you know. JEFF: That’s true, yeah. It’s also got a little Buddy Holly influence in there, too. SPAZ: While the tracks are written by a variety of writers, including yourself, was it difficult to keep it as cohesive as it is? JEFF: Not really. We ended up cutting 17 tunes in 12 days…you know, the rhythm tracks. There’s a wonderful thing that happens when you’re making a movie… I guess any kind of art… For awhile, you’ve got to bring stuff to it to nurture it. Then, after awhile, if things are going well, it starts to tell you what it wants and it starts to direct itself. That’s kind of what happened on this album. There are a lot of good songs that we did, but this was the best combination of songs for this album. We’ve got seven other tunes that I think are just as good that are not on there. It’s just a matter of gathering the material. We started out with about 70 songs and we got it down to just these. SPAZ: Do you already foresee a Jeff Bridges 2 in the near future? JEFF: I hope so, yeah! The music is there, we’ve got these great players and T-Bone, if he’s up for it again, it would be wonderful if it all falls into place. I guess it’s kind of like what they say about getting pregnant. When a woman has a child, she’s all “let’s do it again!” (laughs). You gotta really watch it if you don’t wanna get pregnant, not to go fooling around… and I fool around with music all the time! So, who knows? SPAZ: Coming from a music lover’s background, when putting the tracklist together, did you envision this project as a record with two distinct sides? JEFF: When we were making the music, we didn’t think of it in those terms, no. When they knew that they were going to make a vinyl of it, then we had to have ‘two sides’. SPAZ: You’ve been friends with T-Bone Burnett for over 30 years. Does he instinctively know what sound you were trying to achieve and was he usually successful in translating what was in your head and putting it down on tape? JEFF: When we went through all these songs to try to figure out what songs we were gonna do, he was really looking for something unique, something that was uniquely me, and I really appreciated that. That’s what he was bringing out with the musicians that he brought together. I specifically asked for those guys, too, because I’m a giant fan of every one of them. DAVID RAYBURN: With names like T-Bone Burnett, Ryan Bingham, John Goodwin, Gary Nicholson, and late Stephen Bruton appearing as some of the common denominators on consecutive music projects, can you tell us something about the history of some of these friendships? JEFF: A: Yeah, well, you know, John Goodwin and I, we go back to the 4th grade together. He’s one of my oldest friends and we’ve been writing music for, maybe not that long, but certainly maybe 30 or 40 years. We’d paint and do all sorts of creative things together. He’s a Nashville writer. Very prolific. So, we’ve been writing together and supporting each other’s music for a long time. With T-Bone and Stephen Bruton, we met on Heaven’s Gate 30 years ago. Kris Kristofferson, who starred in that movie, brought a bunch of his musician friends on board to play small roles. We had T-Bone and Stephen, Norton Buffalo, Ronnie Hawkins, a whole slew of just great players, wonderful musicians. And so, Crazy Heart kind of came out of that relationship with Stephen and T-Bone and I had back in those days. And this album was just kind of a natural growth out of Crazy Heart. SPAZ: While some actors have dabbled in music, it’s been a major part of your life. While many have known of your musical talents, do you think Crazy Heart has made it easier for the public to realize that music isn’t just some part-time vanity project for you? JEFF: A: Yeah, I think so. I hope so. I mean, that’s one of the reasons that it seemed like the right time to make some music and put out an album because it was in that same atmosphere that Crazy Heart came out of, and was seen by a lot of people. A lot of people seemed to enjoy that. So, yeah… I’m hoping that will help people enjoy it. SPAZ: Now, what would you say is the difference between selecting the songs for Crazy Heart and this record? Weren’t there a couple songs that were leftover from Crazy Heart? JEFF: Yeah, well you know John Goodwin supplied a song for Crazy Heart… that “Hold On You” song, the opening one is one of his tunes. And a couple of the Bruton tunes were being thought of for Crazy Heart as well. That song “Nothing Yet” was thought of, but you can only have so many songs in the movie, you know. All the songs that we liked that we had in the movie we really liked. Not that the other songs… we didn’t like… it’s just that there’s only so many places, you know? SPAZ: You’ve already shown your worth in acting, art and music. Any desire to take that next step to Broadway? JEFF: (Pauses) I wouldn’t totally poo-poo the idea, but it’s not something I’m actively pursuing in any way! SPAZ: What’s next for Jeff Bridges? JEFF: I’m going to be playing a lot of music up ‘till September. We’re going to be playing Sturgis, that big motorcycle rally. We’re going to be doing Austin City Limits. I’ll be doing a bunch of shows here in California. Then, in September, I’ll be putting my acting hat back on and I’ll be doing a movie with Ryan Reynolds called R.I.P.D. I’m pretty much booked solid doing music until then. I’m also the national spokesperson for a campaign called No Kid Hungry (http://www.nokidhungry.org/) and I’m working on that as well. JEFF: I’m listening to my buddies. I like Benji Hughes a lot. I don’t know if you are familiar with any of his tunes, but he’s got a wonderful album called A Love Extreme. I’m loving a lot of Marc Ribot music. He’s got a great album called Don’t Blame Me. I love that. He’s got a wonderful Cuban album that I love. And also love Johnny Goodwin’s stuff. I’ve got so many people that I’m close to that are wonderful musicians and that’s what I’m listening to, mainly. SPAZ: What would The Dude think of this album? THE DUDE: Oh, he would like it, man! He’d listen to it… he’d put it on his player right between the whales and Creedence, man! Special thanks to Jacki Feldstein, Saul Shapiro, Dave Rayburn and Kimberly McCoy.